Arrival in Istanbul. 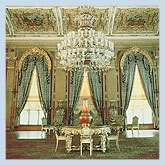 Transfer to your hotel, the Ciragan Palace Hotel. This is a restored Ottoman palace on the banks of the Bosphorus, with one of the grandest views. Historical Istanbul tour. Visit the St. Sophia Museum (built in the 6th century), the Topkapi Palace with priceless collections of jewelry and rare porcelain, the Blue Mosque, famous for its blue Iznik tiles, the Hippodrome Square where ancient chariot races were held, and visit the Grand Covered Bazaar in search of treasures. You will have a short visit to smell the aromas of the Egyptian Spice Market, followed by a boat tour on the Bosphorus, viewing the picturesque beauty of the European and Asian shorelines on either side. After lunch at a local seafood restaurant, cross to the Asian side to visit Camlica Hill and observe the panoramic view of Istanbul. You will tour the summer residence of the Ottoman Sultans, Beylerbeyi Palace, with its original furniture and magnificent gardens. A free day to sample the best Istanbul has to offer. Exquisite food, shopping and culture. Afternoon flight to Izmir ‘’ Pearl of the Aegean’’, nestled on the side of Mt. Pagos on the shores of the bay sharing the same name. Transfer to the Izmir Hilton, where you will find Aegean hospitality and elegant five star service. A full day tour of the ancient city of Ephesus. Visit the House of the Virgin Mary, and the Basilica of St. John (who accompanied the Virgin Mary to Ephesus), the Celsus Library, the marble paved Arcadian Road, the Brothel, the Roman Baths, the theater where St. Paul preached, the Temple of Artemis (one of the seven wonders of the ancient world), and see the statue of Ephesian Artemis while touring the Archaeological Museum of Ephesus in Selcuk. Return to Izmir for overnight. Transfer to Bodrum, for a stay at the five star Bodrum Sea Garden Hotel. It is nestled amidst rocky mountains and pine trees and provides access to 3 different bays with breathtaking scenery. Free time for water sports such as scuba diving, wind surfing, catamaran, or water skiing. Enjoy the food at any of the 4 restaurants specializing in Turkish and International Cuisine. Free day to enjoy a possible visit to a Turkish Bath, saunas, or massages. Enjoy the shopping in ‘’mini Bodrum’’. Watch one of the night shows, such as belly dancers, live music, or Jazz bars. Take an optional tour into the center of Bodrum to visit the historical castle, the museum, or visit one of the many colorful bazaars. 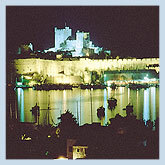 Fly from Bodrum to Istanbul for one more nights stay at the romantic Ciragan Palace Hotel. Transfer to the Istanbul airport. End of our services.